Earlier this year, prominent New Zealanders went to some lengths to demonstrate their opposition to hate speech. Two controversial Canadian speakers were coming into town and were possibly going to say things that, in the words of Auckland’s mayor Phil Goff, “divide rather than unite”. To prevent this from happening, Goff said he’d have them banned from speaking at any council owned venue. Others defended their right to speak. The Free Speech Coalition, a hastily-formed group consisting of members from a range of political backgrounds, challenged the mayor’s apparently unilateral decision to ban them from council owned property. 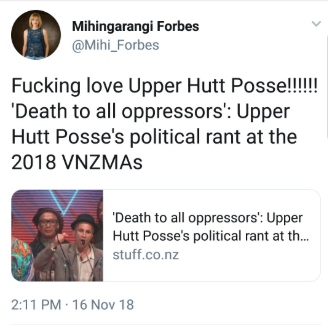 Fast forward four months to the high-profile Vodafone Music Awards, when the recipient of a lifetime music award, Dean Hapeta of hip hop group Upper Hutt Posse took to the stage and, in a rambling speech, called for war against Israel and “death to all oppressors”. “Where’s that Prime Minister, even if it was a fake acting one up here? I got some words for you: all of our armed forces and military that have been fighting in these fake wars in Afghanistan and Iraq for oil, for USA imperialism – get outta there! What you need to be doing is going to Palestine to fight against the racist terrorism of the Israeli state. That is where all of our fighting energy needs to be. “And also, even more, get to the Mexican-USA border and defend that caravan of indigenous people seeking refugee status in the United Snakes of Ameri-KKK-a. They’re seeking refuge because their countries have been wrecked by that colonial power known as the USA. Reports suggest the outburst was met with stunned silence from many, awkward giggles from others, and fist pumps from some of the more woke (and possibly by that time, drunk), audience members. Some, including broadcaster Sean Plunket, remonstrated with Forbes, arguing that it was hate speech. David Cumin issued a press release from the Israel Insitute of New Zealand and tweeted that it was incitement from an antisemite, which should be called out and condemned. 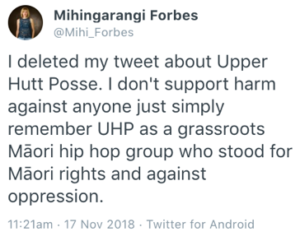 Indignant, Forbes told Cumin not to “tell this Maori woman what I can think”. That weekend RNZ ran an entirely favourable, soft interview with two members of Upper Hutt Posse on its Music 101 programme and read out listeners’ messages defending the speech. 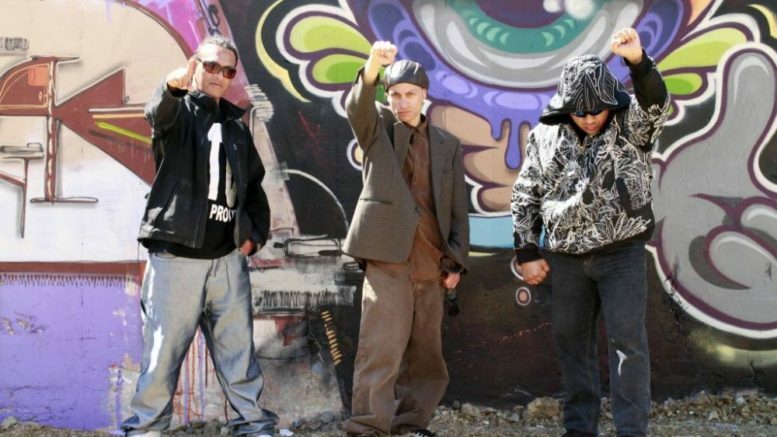 Maori Television similarly ran an uncritical piece highlighting the group’s activism. There was no condemnation in any New Zealand mainstream media, aside from a letter to the editor in the NZ Herald. Green MPs who are pushing for new hate speech legislation – and who also routinely speak out against war in general – were apparently untroubled by Hapeta’s antisemitic war cry. But, you say, Hapeta was just defending the rights of the Palestinians! He’s anti-oppression, not anti-Jew! Let’s examine that. Hapeta took to the stage and, in his moment in the spotlight, took the opportunity to call not for peace, tolerance or coexistence but for violence against the one tiny Jewish state, thousands of miles away. The final words were “death to the oppressors”, and he left little doubt about who he saw as the “oppressors”. In a world of conflict and turmoil, in a region wracked with ancient tribal grievances, hegemonic jostling for power and layers of geopolitical complexity, Hapeta’s solution to righting those problems is to annihilate those troublesome Jews. Sounds familiar. Then there are his Facebook comments, which show a singular fixation and hatred of Jews, who he accuses, among other things, of being a fake people and controlling Hollywood. Hapeta’s rhetoric reflects his long-time admiration for Nation of Islam leader Louis Farrakhan, who he performed for, and who has a disturbing history of virulent antisemitism and just last month compared Jews to termites. Rather than championing the oppressed, Hapeta is denying Jewish emancipation and self-determination. He denies Jews’ very existence as a people, spreads harmful lies about them and calls for violence against them. He’s not fighting oppression, he’s an oppressor. The endorsement of his speech by those with a platform isn’t edgy, anti-establishment social awareness. Their radical-chic posturing comes at the expense of an increasingly anxious minority that doesn’t have the same luxury of distance. Jews are too vividly aware of the recent murder of 11 of their people in Pittsburgh at the hands of someone steeped in the same conspiracies and hatred that appear in Hapeta’s online comments. Jews are too aware of the reality that, around the world, attacks on Jews are steadily rising in frequency. When people make Jews out to be the source of all the world’s evils, and incite harm against them, it should be called out. Those who vociferously condemn hateful views on other sides of the political spectrum should apply the same zero-tolerance approach to marginalisation or victimisation of all minority groups.